How is your Egyptian practice different from your Vodou practice in the feel of it? Mambo T: On a philosophical level, I think much of what is happening there is similar. There is some similarity between all of the African religions. A lot of those religious traditions and spiritual traditions have much in common in many other ways. Egyptian religion is more formal and structured. It is not at all what I would call American. The Egyptians’ philosophy and gods come from a very different place than here; there is no connection. Mambo T: The academic work that I do, part of how the [Kemetic Orthodox] temple was founded, was around translating ancient ritual documents and providing the Egyptian rituals in English. What were they doing and why were they doing it, and can the rituals still be done and made relevant? We [Kemetic Orthodoxy] might be global, but the religion is still very much founded on Egypt. Haitian Vodou was very much founded in Haiti. And if you don’t understand Haitian culture you can’t understand what is being done, at least not the way it is supposed to be done. The Haitian experience has more resonance with people who live in it, in this hemisphere, and is much more multicultural. It is more cognizant of that postmodern world that we live in, dealing with the consequences of colonization and slavery and all of the terrible violence involved in where we live, in North America or South America or the Caribbean. 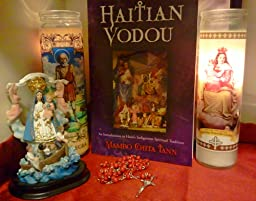 Haitian Vodou is one of the truly “American,” in the sense of Western Hemisphere, religions, and I think it it has a lot of relevance for all of us. Even if we are not practicing it, we can understand what it is about, because its entire purpose was to try to figure out how to reconcile ourselves with where we are now and how we are here. My mother’s family left indigenous lands very early and we lost touch with our root culture in our family. I spent a long time trying to understand that part of my family, Even though it doesn’t come from the same land, Vodou helped me begin to speak to that whole. Tell me about your workshop about appropriation, ancestors and navigating relationship. Mambo T: As a person from a diverse background, how do you understand the different parts of yourself. How do you deal with it? I’m not Egyptian, though way back I’m supposedly descended from the Ptolemies thousands and thousands of years ago, but that doesn’t have any immediate relevance in my family. Within the Egyptian tradition, there is a lot of talk about the fact that Egypt is in Africa and there are people who are trying to embrace that. There’s kind of an argument about who owns the legacy of ancient Egypt. There has been quite a lot of discussion on the Internet about that legacy. It is a very important conversation going on. ln the United States there’s also a lot of talk about Native Americans and regarding how a person who wants to honor the Earth and a land that didn’t belong to their ancestors approaches it. How do you deal with that? Is there a respectful way to approach local land spirits? These are really important conversations, and Haitian Vodou has this conversation too, because Vodou was created out of the slavery experience, out of multiple religious traditions, and even from the white slave owners’ traditions, including Catholicism. How do you deal with a tradition that includes Catholic saints and Jesus and also clearly not Christian material? Anybody who lives in the Americas has to confront this multicultural experience at some point. Is ancestral linkage really relevant to our choice of spiritual practice anymore? Mambo T: It is always relevant. In fact, I think because of the DNA testing available it becomes more important because people naturally like to label things in nice little compartments. It would be very easy to look at your DNA sequence and say, “I’m 97% Norwegian so I should only worship Norwegian Gods.” Conversely if you wanted justification for some obscure thing, if you got your DNA back and you were like 0.002% Native American you could say, “Hey, I should do Lakota sweat lodges.” There is an ongoing conversation around identity and around technology. DNA says things about where you come from, but does not say anything about who you are. I come from a native tradition where people who are descended from the people, and people who are adopted in or have mixed blood are equal citizens. Identity is much more complex than DNA. You cannot as an outsider or stranger, just walk in to a culture and be accepted. I want to have this conversation in the workshop because there are lots of people, a lot of input, and lots of experience with these issues. And as spiritual people, we’re going to be confronting this more and more as we get more multicultural, as we get people brought up in multicultural experiences and the gods and spirits start talking to more and different people. Once you start talking to ancestors and honoring ancestors and Gods and they start talking, how do you deal with that? I had no desire to add anything else to my spiritual work and then this completely different group of spirits came along. This [experience] is going to become more common, and that is part of the discussion. There is always a way to get involved in a tradition that is not yours, that is still healthy and legitimate. You are doing a ceremony Saturday night? Mambo T: We have to do it on Saturday, as that is the way that our ritual protocols work. Friday is a day exclusively for working with the dead and a specific set of spirits. We would only be able to serve them and none of the others. I’ll be giving a basic demonstration of how a ceremony works. Sunday we don’t do any ceremonial work at all. It is in the evening Saturday so we are not limited by a workshop time span. Would you describe this as a celebration, spiritual event, ritual, or all those things? Sunday you are doing the intro to Haitian Vodou? Mambo T: We will talk about Haitian Vodou and in particular, the various spirits or Lwa. We are also planning on doing an open lunch in our suite from 12 to 2 on Friday, and if anybody wants to come and talk about Voodoo then, they are welcome! And Sunday afternoon, after my lecture, I’m also going to be on the panel; Magic, Justice, and Life, that Thorn is leading. Are spiritualists activists or are activists spiritualists, or should they be both? Mambo T: People need to be where they are comfortable. Being public about your spirituality when your spirituality is not mainstream is an act of activism in and of itself. If you’re willing to be to be out there and say you are very different from the culture around you and willing to be an example, that’s a thing that takes courage. Taking the responsibility to step up and make the world a better world is itself a very holy, very sacred mission of human beings. I don’t think you have to be spiritual to do it, but many of who are living their spirituality do. Yet, I don’t think that is required. I have personally been an activist for a long time and in a couple of different ways. For me, that was a parallel experience with my spirituality. If you come from a place of comfort and privilege, can you be a social activist? Mambo T: I don’t think it’s impossible for people who come from a place of comfort and privilege to be activists. I think it might be more difficult to understand the need for activism. It can be problematic, if you step in from a place of privilege into an activist role without acknowledging your own experience. To be involved in social activism requires a serious amount of self examination. Not everybody is ready for that type of work. That is probably where spiritual work and activism have the most in common. If you’re going to do either of them well, you have to look at very uncomfortable things about yourself. You have got to know yourself very well. Not easy work! Knowing your identity is critical if you are going to have any sort of integrity. That is why we call it work! Any words to the folks of Paganicon? Mambo T: I am excited to meet them! It is a new group of people for me. Looking at the programming and those presenting it seems like it might also be a new perspective. They are coming from different backgrounds from the people that I often talk to. I spent a lot of time outside of the Pagan community, for lack of a better descriptor. I had been involved very heavily in the Pagan and Wiccan community in Chicago a little more than 20 years ago and left discouraged, so we did our own thing for a long time. Only recently have I been interested in looking back at the community. This community has changed. It is not so much about personalities anymore. I see really good, serious, positive stuff going on, where more people are addressing things and doing things in an increasingly healthy way. I like that, I’m really happy to encourage that, and I’m excited to step back in again. Discount Registration for Paganicon is closed, but you can still register in advance, or at the door for the weekend, a day, or just the costume ball. Read the full schedule! Mambo T/Rev. Tamara will also be signing books at 11am on Saturday! Sosyete Fos Fe Yo We hosts the Vodou Lounge! Come by to discuss Haitian Vodou, share in some magical fun, or just enjoy like-minded company. Everyone is welcome; no Vodou experience is necessary. We will be hosting some events in the suite over the weekend, as well as offering space for Rev. Tamara’s Kemetic Orthodox group to provide their own social and information gatherings! Friday 12-2p “Vodou Lunch” – join us for light snacks, conversation, and learning! Bring your own lunch if you like. Friday 3-5pm Kemetic Salon: Rev. Tamara and other priests and members of the Kemetic Orthodox House of Netjer will host an open discussion salon on all topics related to Kemetic (ancient Egyptian) polytheism. Everyone is welcome! Saturday 3-6pm “Vodou Lounge”: Sevis Preparations: stop by if you’d like some preparations and pointers on how to salute the Lwa, sing some Vodou songs, or participate in other ways in tonight’s Vodou ceremony (sevis) starting at 9pm. No prior experience necessary. Everyone is welcome! Sunday 2-4pm and after dinner to ?? : “Vodou Lounge”: Open House. Join us for conversation after Mambo T’s talk.